Karachi, The colorful Fashion Pakistan Week is finished in Karachi and it has left some beautiful memories. There are gossips over the friendship of actress Hania Aamir and singer, Asim Azhar on the social media. The three days fashion Pakistan week was conducted in Karachi and the wonderful and beautiful dresses of various leading and well known designers were displayed in this show. The beautiful chemistry of Hania Aamir and Asim Azhar was also discussed and it got the attention of the public. Hania Aamir & Asim Zafar Friendship Getting Popular. 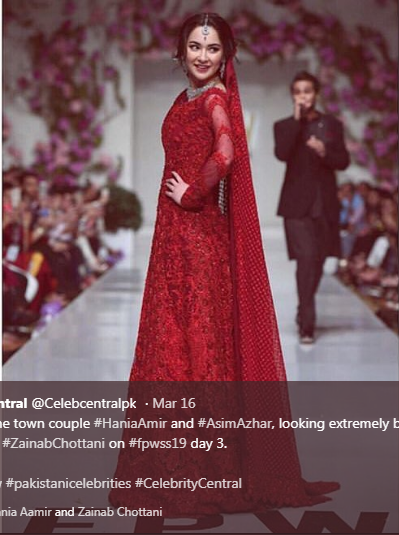 Hania Aamir was dressed in red colored dress of the bride designed by the leading fashion designer, Zainab Chotani and she won the hearts of the people. When Asim Azhar entered in the hall and he started singing song seeing her and during this time, Hania was feeling shameful. The audience in the hall got the entertainment over the style of Asim. The beautiful dresses of the participating designers of the Fashion Pakistan Week were being discussed on the social media and Pakistani actors were also discussed there. 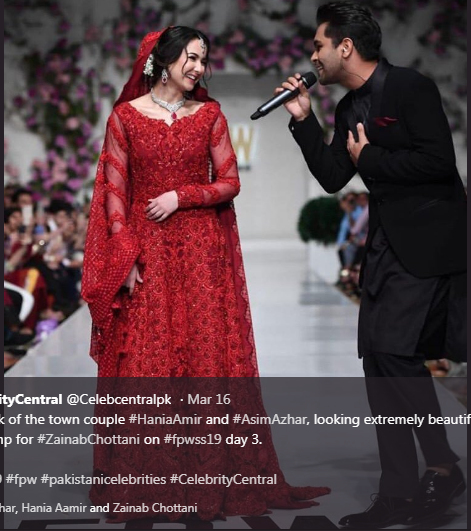 They also liked the couple of Hania Aamir and Asim Azhar. Asim was singing a song for Hania in the video and it is getting viral on the social media. 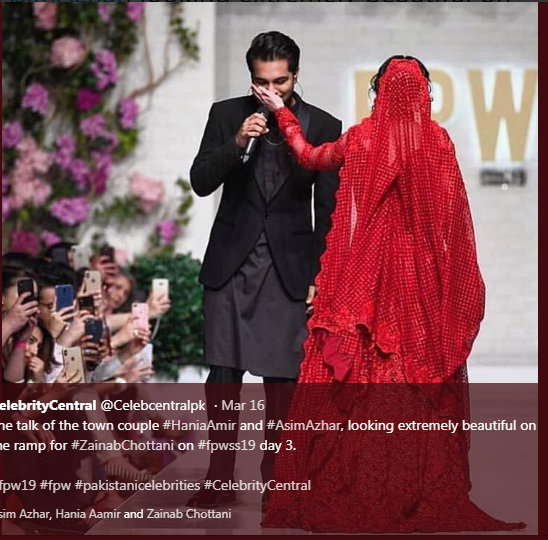 There are some other pictures of Hania and Asim, which are being viral on the social media and both of them were looking in good mood taking hands of each other.